Of course, he was right to be proud of his achievement. The WCAG (Web Content Accessibility Guidelines), published by the Web Accessibility Initiative of the W3C consortium, are ‘a single shared standard for web content accessibility’. It’s important to meet them. But I was also right. The purpose of the guidelines, and of all accessibility initiatives, is to create things that people with disabilities can use. For example: my father. His sight is no longer good enough for him to be able to drive, so now grocery shopping happens online. He struggles to read anything on paper, but the web means he can continue his historical research. Up to now, there were books and resources about making things work for people with disabilities, and there was WCAG. But there were lots of gaps between them. 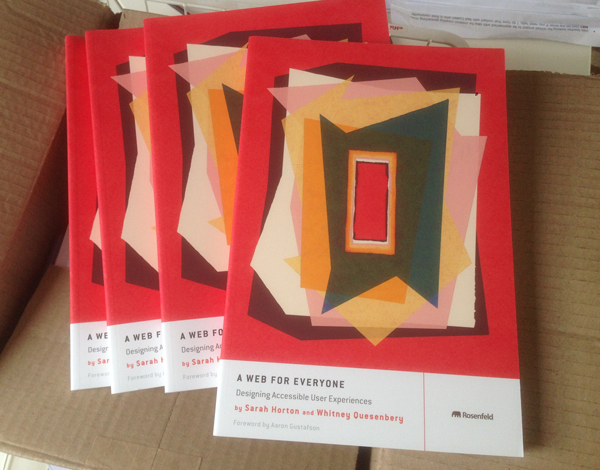 Sarah Horton and Whitney Quesenbery have magnificently filled those gaps with this book, A Web for Everyone: Designing Accessible User Experiences. I’m going to declare an interest: they shared an early draft with me. At that stage, their intention was clear and what I wanted. But I hope they won’t mind if I reveal that the draft I saw was best described as a muddle. I cheered them on – but between you and me, I wondered if they’d manage to deliver. Well, they certainly did. A remarkably short time later, I got back my copy. Wow! This was the book that I wanted them to write. It’s clear, it’s engaging, it’s practical. It’s about making things work for people with disabilities. And it explains how what we need to do relates to the WCAG standard. I’ve bought a dozen copies because there are so many clients and colleagues that I want to read it. Highly recommended.